“In a scenario in which Widodo wins by an unexpectedly narrow margin, large and prolonged protests in Jakarta would elevate tensions and pressure the currency,” Kevin O’Rourke, a political analyst and author of Reformasi Weekly, said. Widodo ended his six-month campaign with a mass rally at Jakarta’s main stadium at the weekend, where festive crowds overflowed into a surrounding park and streets. Running ran out on stage in sneakers, to the cheers of the crowd after an hours-long concert by local bands, he struck an optimistic tone for the future of the world’s third-largest democracy. That was a stark contrast to his opponent, who has repeatedly warned Indonesia is on the verge of collapse. Prabowo, as he is usually known, held a similarly big rally the previous weekend where supporters, many dressed in Islamic robes, held a mass prayer before a fiery speech about how Indonesia was being pillaged by foreigners and the elite. In a televised weekend debate, Widodo and his running mate, Islamic cleric Ma’ruf Amin, said their opponents, neither of whom has served in public office for more than a few months, did not understand managing macrolevel economics. Widodo, a moderate Muslim from central Java, has had to burnish his Islamic credentials after smear campaigns and hoax stories accused him of being anti-Islam, a communist or too close to China, all politically damaging in Indonesia. Prabowo, who has close links to some hardline Islamist groups, and his running mate, business tycoon Sandiaga Uno, have pledged to boost the economy by slashing taxes as much as 8 percentage points, and focus on key infrastructure projects. More than 192 million will also vote in national and regional legislative elections, being contested by more than 245,000 candidates, in what is being described as the world’s biggest single-day election. Overseas voting is already underway, with thousands lining up outside Indonesian missions in Singapore and Australia. 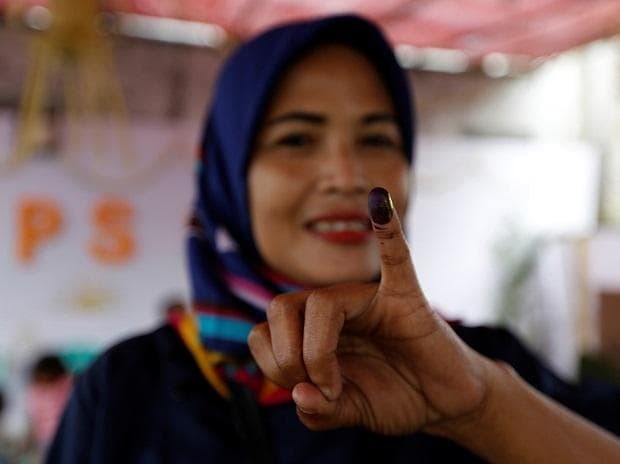 On Wednesday, polling stations will open at 7 a.m. (2200 GMT Tuesday) in eastern Indonesia and close at 1 p.m. (0600 GMT) on the western side of the country. Voters will manually punch five separate paper ballots for president and vice president, and legislative candidates. Unofficial “quick counts”, based on vote samples from polling stations, will be released hours after polling ends and the winning presidential candidate is expected to be apparent by late Wednesday. The General Election Commission is expected to announce an official result in May. Candidates have 72 hours after the official result to complain to the Constitutional Court. A nine-judge panel has 14 days to reach a decision, which cannot be appealed.